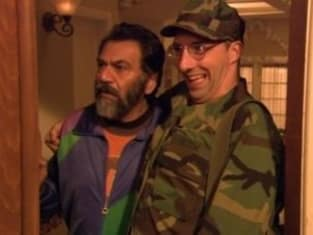 Michael: Don't tell me he's not in Iraq. Wayne: Oh, no, he is. In fact, he is on the news right now. Turn the TV! Man on the news: Coming up next: Are bees better at sniffing out drugs than dogs? Wayne: I'm sure it's coming right up. You see, they won't take all day. (Minutes later, and still not on) I bet it's after these unserious ads. It's like they're always there when I turn the TV on. Cho: Why don't we go online? Wayne: Cool your Japanese jets. This is just go -- Uh, it's on! Arrested Development Season 3 Episode 12: "Exit Strategy"
Narrator: She was wrong on that one. It was love that make Gary take that step.